The Oregonian reports there was an SUV accident that occurred this morning, August 25, 25 miles outside of Portland on U.S. 30. The accident happened at approximately 5:45 AM, when Joseph McMahon crossed the center line of U.S. 30, near milepost 33, 25 miles outside of Portland. After crossing the line, the 19-year-old’s SUV collided into the left side of a semi-truck driven by Elliott Schwartzkopf, 43, of Hillsboro. Schwartzkopf was uninjured. His semi incurred a few damages including the removal of one of his side tires. 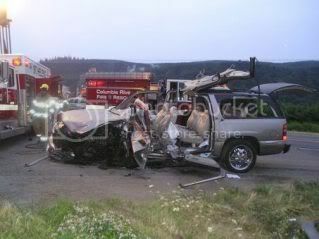 The accident caused McMahon’s SUV to crumple, and the roof of the vehicle to peel back, forcing the Columbia River Fire & Rescue teams to extricate the driver using the “jaws of life“. Upon removal, McMahon was transported by lifeflight to Legacy Emanuel Hospital & Health Center, where he is currently listed in fair condition. Both drivers were wearing seat belts. We are glad to know that Elliott Schwartzkopf did not suffer any injuries as a result of what may be another driver’s inattentiveness. We hope the few repairs needed on his semi-truck will not take much time or money, and that Elliott can go back to his working and living a normal life. This is a crash that will take some time and effort to understand exactly what happened. Some, after reading about this accident, will assume that the McMahon was fatigued and fell asleep momentarily, and that certainly is the most likely explanation. On the other hand, The article describes that a light rain had started to fall prior to the accident. It is possible that the rain added to the overall slickness of the road, making it harder for the driver to maintain control of his vehicle. As Portland injury attorneys who want to help out in this difficult situation, but without being ambulance chasers, we would like to offer a complimentary copy of our book to Elliott Schwartzkopf and the other drive. This book, 7 Common Mistakes That Can Wreck Your Oregon Accident Case will help you in your dealings with the legal side of things, without having to get a lawyer involved before you want to.